We were cold and tired this week, and so logically we were craving comfort food. Here is what we came up with. This recipe is very simple, delicious and comforting. 1) Dice the vegetables in small pieces. 2) Heat the vegetable oil in a sauce pan. Add the garlic and onion and stir until the onion is slightly transparent. 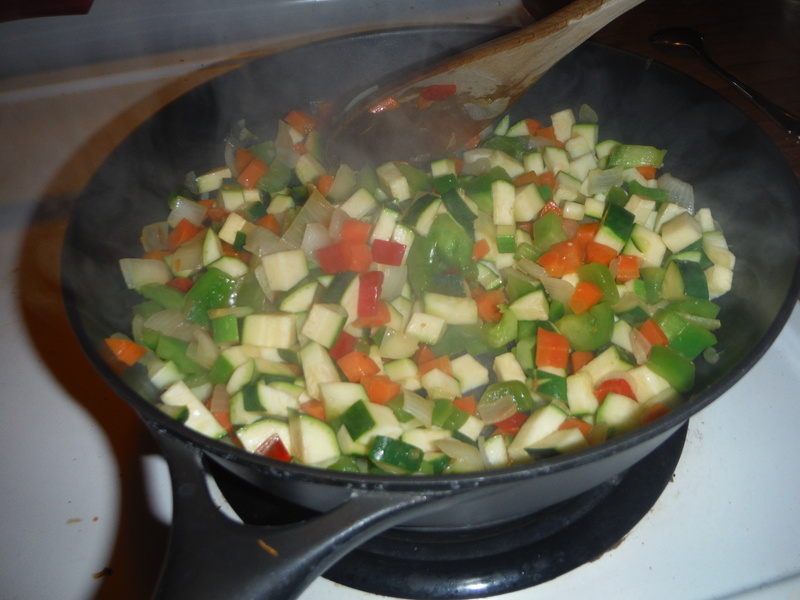 3) Add the zucchini and bell peppers. 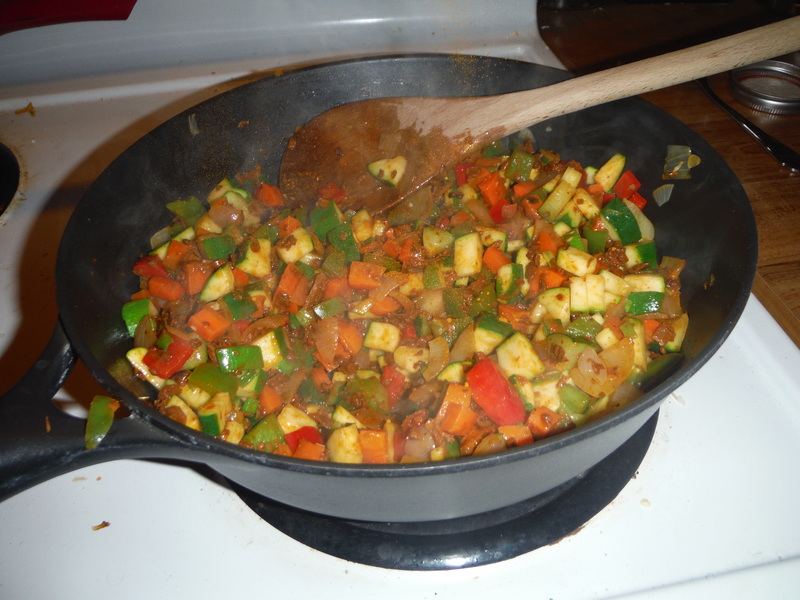 Stir until the vegetable are almost cooked. Stir vegetables! Tons of them! 4) Add the tofurky and spices, and stir well. 5) Heat the rice in the microwave until soft. Add to the sauce pan and stir delicately so as not to much it out. 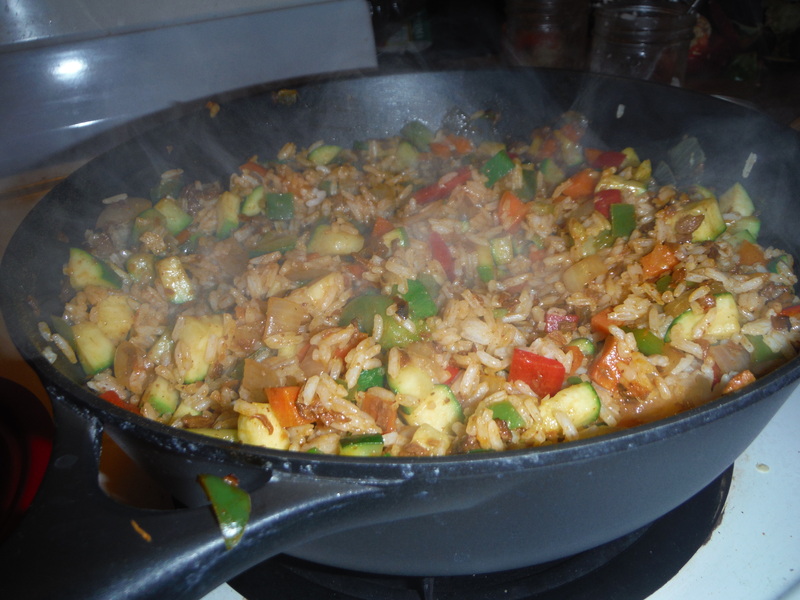 Preheating the rice will help as you won’t need to stir it as hard. 6) Add the soy sauce and sesame oil, and stir. This recipe is very tasty and nutritious. We felt like it was an hybrid between fried food and paella. Eaten in a bowl, it is the ultimate comfort food! Adding the tofurky adds a bit of protein which makes it the perfect lunch to bring along your adventures. The sesame oil gives this a very fragrant and tasteful flavor. You could also add some edamame beans or corn, or pretty much any other vegetable you enjoy! Tell us if you try this out! What’s your favourite comfort food?